Every shoe becomes slip ons with dark gray no tie elastic flat shoelaces. Why do people choose to turn their shoes into slip ons? 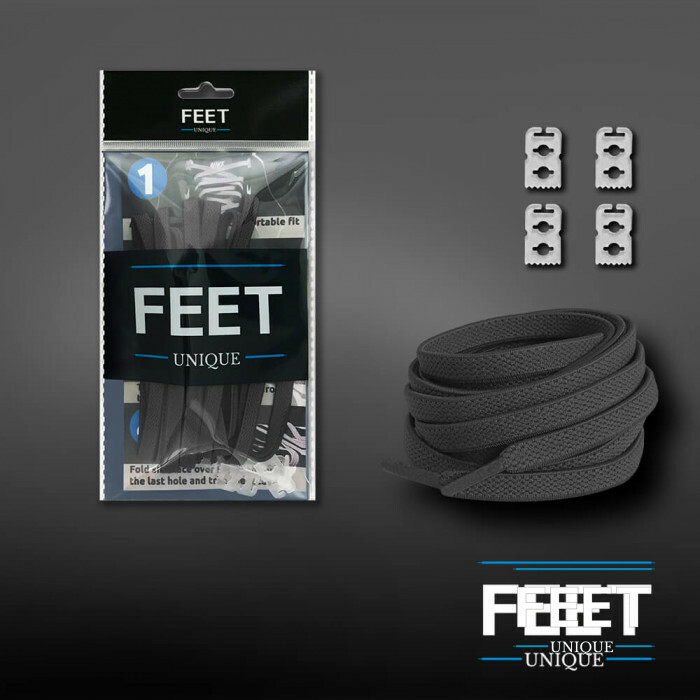 Because with dark gray no tie elastic flat shoelaces they'll never have to tie their shoes again, experiencing the same great look and fit, every single day. Once your friends and family see how much time you're saving not tying your laces and how good your sneakers look, they're going to want to join in on the fun. And whether they are kids/children sizes or these are the biggest feet in the house, our dark gray no tie elastic flat shoelaces fit comfortably. Simply lace them up, tie them to your perfect tightness, put in the lace locks and then trim the excess laces. Until the shoes wear out, you'll have a pair of slip ons that feel great and look even better. Dark gray elastic flat shoelaces will outlast the shoes themselves. Durability is one of our top priorities. Whether our most finely-threaded dress shoelaces or laces made for hiking boots, FeetUnique makes footwear accessories that last longer than anywhere else. But that's even more true for these laces. This material will outlast the shoes you thread them into, guaranteed. They never fade & never fray - We guarantee it. A subtle but stylish color that goes with everything. Dark gray is a color that you can use whether you're going somewhere formal or casual. It's not a loud color, it's a cool color, the kind that lets people know you're more bold than solid black while not trying to stand out like pure white. Dark gray also does a great job of toning down strong and daring colors, creating a unique look that goes well with any types of shoe.